Manage accounting processes collaboratively with Smartsheet. If you’ve been tasked with managing the financial records for your company, you have a big responsibility. Ensuring that you keep accurate records to produce financial statements such as balance sheets, income statements, expense reports, and more, is important to help internal and external stakeholders make essential business decisions. To get started quickly, it may be helpful to use a familiar Excel accounting template. But, with all the templates out there, how will you know which one is best for you? We’ve researched the best Excel accounting templates and have included them here for you to download, along with a description of when to use each. 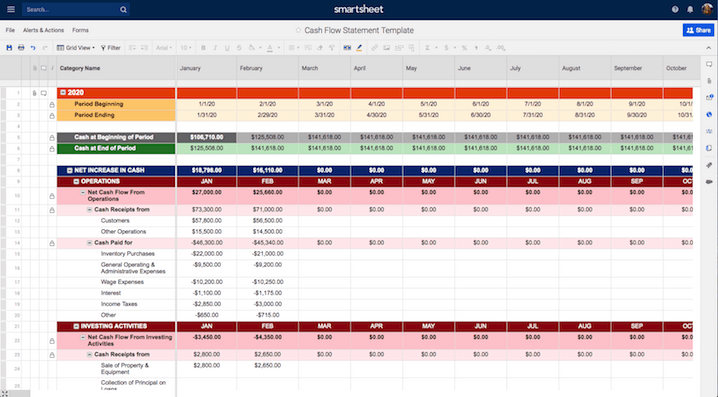 We’ve also included links to similar accounting templates in Smartsheet, a spreadsheet-inspired work management tool that makes accounting processes even easier and more collaborative than Excel. An accounting journal is an accounting worksheet that allows you to track each of the steps of the accounting process, side by side. This accounting journal template includes each step with sections for their debits and credits, and pre-built formulas to calculate the total balances for each column. When making large purchases for items like inventory, supplies, or equipment it may be necessary to do so on credit, which could result in multiple monthly payments made to different vendors or suppliers, due on different dates. Using this accounts payable template will help to keep track of what you owe to each party, and will provide a quick look at the total outstanding balances and due dates. Every company should have a process in place to manage the outstanding balances owed to them. Using this accounts receivable template will help streamline the process by providing a place for you to track the amounts due to your company and help prioritize collection efforts. For any company providing goods or services, using an invoice that looks professional and can be customized to fit your needs, is important. This simple bill template will help you get started quickly. Add your company details and payee information, provide an itemized list of the description, quantity, and price of each item you are charging for, and include directions on how your customer may remit payment. A bill of lading is a document detailing how goods are being shipped from a seller to a recipient. It includes details about the items being shipped, the quantity of items included in the shipment, and the destination address. Use a bill of lading template to ensure you complete this document for each shipping transaction. This template includes a signature section that should be signed by you, then the shipping company, and finally the recipient, so that if the shipment is lost, the signature detail will help identify at what point it was lost and who was liable. A billing statement is helpful if you receive regular bi-monthly or monthly payments from your customers. Use this billing statement template to track customer invoices, account details, and billing status, all in one location. Additionally, this template looks professional and is customizable to match your needs. A cash flow statement is important to provide a good picture of the inflow and outflow of cash within your company. It shows where the money came from (cash receipts) and where the money went to (cash paid). Use a cash flow statement template, in conjunction with your balance sheet and income statement, to provide a comprehensive look into the financial status of your company. This cash flow template includes two additional worksheets to track month-to-month and year-to-year cash flow. Creating a cash flow forecast can be helpful for managing your business’ finances. It enables you to estimate how much money your business will make and spend at any given point, and will allow you to take the appropriate steps to ensure that your cash outflow is not more than your inflow. Use a simple cash flow forecast template to get started quickly. Be sure you include all income including revenue and investments, and account for all expenses including fixed costs. A simple expense report is helpful to keep track of business expenses for an individual, department, project, or company, and provides a quick way to document and track expense details. You can require that your team submit monthly expense reports or as the expenses are accrued. Use this expense report template to quickly input specific expense details and obtain approvals as needed. An income statement, or profit and loss statement, provides a look into the financial performance of a company over a period of time. The statement provides a summary of the company’s revenue and expenses, along with the net income. Use this income statement template to create a single-step statement that groups all revenue and expenses, and is helpful for businesses of all sizes. You will likely have multiple bills to pay in a month, to different companies and on different dates. It is important to have a way to track when specific bills are due, the amount that is due, and to whom. Use a simple payment schedule template to track these details. This payment schedule template will help you remember when each bill is due and be able to budget accordingly. A simple balance sheet template provides a quick snapshot of a company’s financial position, at a given moment. Use this balance sheet template to summarize the company’s assets, liabilities, and equity, and give investors an idea of the health of the company. Whenever you or your team are scheduled for business trips, it’s helpful to have a travel itinerary that lists the details for transportation, lodging, car rentals, meetings and more. Use a simple business travel itinerary template to keep all of these details in one location, and be able to share the details with important stakeholders. Smartsheet is a spreadsheet-inspired work management tool with robust collaboration and communication features. Its pre-built accounting templates make it even easier to create reports, track progress, manage documentation, and quickly organize the details. And, Smartsheet offers robust templates that makes it simple to get started right away and share status with your team. Gantt charts are automatically created and auto-adjust every time you change task information, so there is little setup required when you want to visually show progress. You can easily switch between spreadsheet, Gantt, and Calendar views with team members or external collaborators, without emailing static spreadsheets back and forth. And, with Smartsheet’s powerful collaboration features like discussions, reminders, and attachments, you can store all documentation in one place for everyone to view, access, and make changes in real time. See how easy it can be to manage your accounting processes in Smartsheet. Thank you. I was looking for a way to help my husband manage the financial aspect of his business. This is it. I wish to save all of these to one spreadsheet if possible. Just leaning. Thanks!!!! I would like to thank you for the reviews and provision of these information. It is very important and I am now using these templates to run my preschool. These are easily understandable and simple to do effectively. Greatly thank you I appreciated. Thank you for such time saving resources. What will the world be without the goodness and unselfishness of others. Thank you!! I got the things that I have been looked for and very helpful to me. this blog has resolved all my problems and saved so many hours of my productive time. Thanks. highly recommended. Its helpful for all financial analysis.